A US mother and her boyfriend appeared in court on Tuesday to face charges in the beating to death of the woman's four-year-old daughter, sparking a furious outburst from the child's biological father. 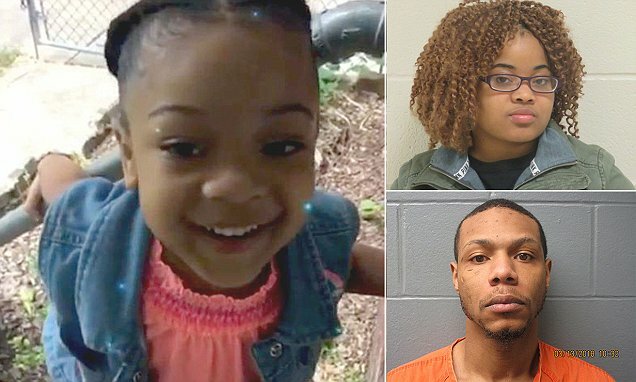 Sierra Day, 23, and Deonte Lewis, 26, both from Ohio, United States, were charged with aggravated murder after the woman's four-year-old daughter, Aniya Day-Garrett, suffered a fatal stroke that officials say was caused by repeated blows to the head. A judge set the couple's bonds at $1 million each. As they were being led out of the courtroom, the little girl's father Mickhal Garrett jumped to his feet and screamed in anguish: "You killed my f***ing child! You hurt my baby." Mickhal Garrett is seen wailing and sobbing in court all through the bond hearing. He then collapsed, sobbing, into the arms of family members who accompanied him to the bond hearing. Mickhal Garrett had earlier reported a case of possible child abuse to child services, but the department dropped the case, saying there was not enough evidence. Aniya was rushed to Euclid Hospital in Ohio, where she died of a stroke. Staff reported her death to police as a suspected homicide. Police said paramedics were called to the Cultural Garden Apartments on Lakeshore Boulevard in Ohio at around 11.30 am on Sunday for a report of a child with burn marks who was unresponsive. Fire officials said there was no fire at the complex. A GoFundMe account has been launched asking for donations to help with Aniya's funeral expenses. It has raised more than $2,600 so far.